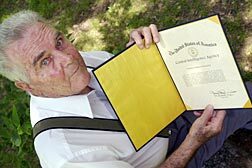 Robert Rousselot holds his citation from the U.S. Central Intelligence Agency, which honored him this month for service in a job he never admitted to doing until now. OKAY -- A herd of cattle grazes slowly, as if there weren't cars speeding by just a few feet away. The pipes that make up the cattle guard are incentive enough to stay put. Metal buildings and barns dot the flat ranchland. But Bob Rousselot's home is set deep into the property, a tidy house hiding in a thatch of trees. Annabell and Robert Rousselot moved here in 1966 when he decided to become a rancher. All he wanted was some land with a few trees and some water nearby. He got it on the banks of Fort Gibson Lake in Okay, where he raised two sons who respectfully call him "The Boss." A sign that sits over Rousselot's chair cements the nickname's place in this house. It's a title that he could have earned anywhere in the world, but he got it here on the ranch. Back in the days when Rousselot was running a successful airline in Asia, he was just "Rouss." It's how he was known to CIA agents and friends alike. Rousselot won't talk until the citation is in his hand. Only when his son and wife bring it back to the ranch does he really believe it. The Central Intelligence Agency honored him June 3 for his distinguished service and leadership in a job he's never admitted to having until now. His wife, and son, Wade, accepted it on his behalf in front of 900 people at the annual Air America® conference in Las Vegas. First as chief pilot and then as vice president of operations for Air America®, Rousselot was helping the CIA, which had secretly bought the airline in 1950, he says. As a pilot, he snuck across enemy borders to drop guerilla fighters into countries that were falling to communism. He dropped weapons and food in China, Vietnam, Korea and Laos. Later, as an executive for the airline, he also helped run the commercial airline that Air America® told the world it was. During the day, Rousselot managed hundreds of employees -- the pilots, flight attendants and mechanics that it took to run flight routes through Asia. But he was also sending those same pilots out on missions for the United States. Rousselot's wife knew, of course. But she was CIA, as well. With so many employees, however, the secret wasn't kept for very long, Rousselot knows now. "It's like a man walking through a hotel lobby with his zipper open," Rousselot says. "Everyone knows but him." He wasn't going to be the one to blab about it, though. "I was always taught to keep my mouth shut and my head in the sand," he says. Even when he knew he was getting the citation -- and that the secret was officially out -- Rousselot waited to talk about it. Now, he pulls out that citation over and over again. "I never thought I would ever see one of these," he says. In 1946, as a young fighter pilot about to be discharged from the Marines, Rousselot started hearing stories about Gen. Claire Chennault and the small airline he operated. "It was a ragtag little cargo airline in China," he says. But through the U.S.-sponsored Chinese National Relief Program, it was developing a reputation dropping medical supplies and food to the Chinese amid their civil war. Rousselot signed up to help. The cargo business kept the airline alive, Rousselot says. But in 1950, company officials got an offer they didn't think twice about accepting. The CIA secretly arranged to buy Civil Air Transport because of its reputation in the tumultuous country. The airline was to help "support the Republic of China nationalist government." With the nationalist government struggling against the communists, the CIA-trained teams were stationed all over the region -- at the edge of Tibet, in western China and in the surrounding countries, Rousselot says. The teams were trained to sabotage the communist troops and report back strategies to the CIA. Civil Air Transport was supporting them all by sneaking in food, arms and sometimes reinforcements. The pilots also were sent out on "leaflet flights," Rousselot remembers. They would pick a region of China and dump thousands of leaflets to the people. "They said, 'Keep the faith. Everything's going to be fine. There's a big uprising.' As time went on, we had pretty much saturated the area." After the borders were closed, Rousselot made one of the first -- and deepest -- overland flights into China. By then, the airline was stationed in Taiwan and the anti-communist forces were losing. Fueled by successful missions all through China, Civil Air Transport pilots were asked to assist in the Korean War, airlifting supplies to troops, and later to help the French hold on to their colonies in Indochina. In Dien Bien Phu, Vietnam, French paratroopers were trying to fight back an oncoming army. But with depleting supplies, they were falling fast. The government asked Civil Air Transport pilots to step in and fly ammunition and food into the isolated valley. "They would have wiped out the French right there," Rousselot says of the approaching Vietminh. "We flew when French pilots wouldn't" come in to help. "We had a motto," Rousselot says. "First in and last out." Civil Air Transport flew 682 missions into Dien Bien Phu between March 1954 and the city's fall in May of the same year. By this time, though, Rousselot wasn't flying anymore. "I was restricted from flying because of the secrets I knew," he says. But he was handpicking the pilots who were to go. He lost two pilots in the mission, he says. Of the thousands of employees, Civil Air Transport officials count 242 casualties. The CIA counts 243. "The largest part of these losses came in Cambodia, Laos and Vietnam," Rousselot says. "They were shot down." 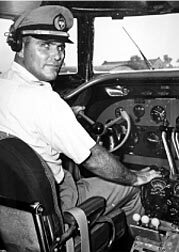 A young Robert Rousselot sits in the cockpit of the plane he flew as an Air America® pilot, ferrying troops over enemy borders and into countries that were falling to communism. In 1959, Civil Air Transport was renamed "Air America®." "We'd have a pilot one day in uniform with stewardesses, and the next day in camouflage clothing on a midnight flight crossing the water from China," he says. "Civil Air Transport and Air America® coexisted," Rousselot says. And, even while trying to aid the U.S. government, Air America® had to begin competing with commercial airlines like Pan-American. He was ready to ranch, and a friend told him Oklahoma was beautiful. It took a couple more years to get here -- he was waylaid by a commercial airline that needed some help -- but, when he did, he didn't want to leave. He built one of the larger ranches in the area. Civic commendations cover the walls of his home. But he had nothing from his years with Air America® until now. Not even his stories, because he didn't feel like he could tell them to anyone but his sons. He now tells a story about losing 12,000 pounds of money over China. The nationalist government in China was printing money in the United States. Civil Air Transport was asked to fly it back to the country but experienced engine problems during the flight. Worried about having too much weight on board, Rousselot's crew started pushing the barrels of money out of the plane. After landing successfully, Chinese security guards searched every inch of the plane for the money and dogged Rousselot's every step for weeks to make sure that he hadn't stashed it somewhere. No one believed him, but none of those millions made it back to Okay, he laughed. It was a story that Wade Rousselot has heard several times now -- but one of the few. "He told us what he wanted us to know -- not everything," Rousselot's son says. "There's still stuff he won't divulge." Ashley Parrish, World staff writer, can be reached at 581-8318 or via e-mail at ashley.parrish@tulsaworld.com.